Dubai: His Highness Shaikh Mohammad Bin Rashid Al Maktoum, Vice President and Prime Minister and Ruler of Dubai, on Sunday began accepting condolences over the death of his son, the late Shaikh Rashid Bin Mohammad Bin Rashid Al Maktoum, at Zabeel Palace in Dubai. Shaikh Mohammad, accompanied by Shaikh Hamdan Bin Mohammad Bin Rashid Al Maktoum, Crown Prince of Dubai and Chairman of Dubai Executive Council, is accepting condolences from mourners until Monday. Shaikh Mohammad has so far received condolences from Shaikh Hamad Bin Khalifa Al Thani at the Zabeel Palace. The meeting, which was attended by Shaikh Hamdan Bin Mohammad, Shaikh Hamdan Bin Rashid Al Maktoum, Deputy Ruler of Dubai and UAE Minister of Finance, Sheikh Maktoum bin Mohammed bin Rashid Al Maktoum, Deputy Ruler of Dubai, Shaikh Ahmed Bin Mohammad Bin Rashid Al Maktoum, Chairman of the Mohammed Bin Rashid Al Maktoum Foundation, Shaikh Saeed Bin Mohammed Bin Rashid Al Maktoum, and Shaikh Mansour Bin Mohammed Bin Rashid Al Maktoum. Shaikh Mohammad also received condolences from Tammam Saeb Salam, Prime Minister of Lebanon. During the meeting, which was attended by Shaikh Hamdan Bin Mohammad, the Lebanese prime minister expressed his grief for the great loss, praying to Allah Almighty to bless the soul of the deceased with mercy and bestow patience and solace on the Al Maktoum family. Condolences will be received from 10am to Dhuhir prayers and after Asr prayers to Maghrib prayers, according to the Dubai Media Office. 1. 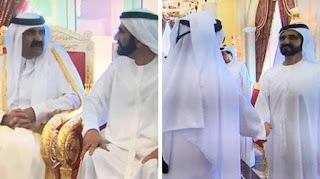 Shaikh Rashid Bin Mohammad Bin Rashid Al Maktoum was the eldest son of His Highness Shaikh Mohammad Bin Rashid Al Maktoum, Vice-President and Prime Minister of the UAE and Ruler of Dubai and Her Highness Shaikha Hind Bint Maktoum Bin Juma Al Maktoum. 2. He was born on November 12, 1981. 3. Shaikh Rashid completed his schooling at the Rashid School for Boys in Nad Al Sheba in Dubai and graduated from Britain's Sandhurst Military Academy in 2001. 4. Dubai Cares was Shaikh Rashid’s brainchild when it was launched in 2007. 5. He was a sports enthusiast and used to play football for Dubai Football Club, of which he was also president. 6. His favourite football team was Manchester United. 7. Shaikh Rashid owned many race horses and was a keen rider. He took part in many equestrian endurance races winning several, including the 120km Pyramids International Endurance Championship at the Giza pyramids in Egypt. He also won the individual gold in the 2001 edition held in Perugia, Italy. He shared the top spot in the FEI Emirates Endurance Worldwide Ranking in 2003. He also won the individual gold in the 120-km endurance ride at the 15th Asian Games held in Doha in 2006. 8. He owned Zabeel Stables in Dubai. 9. With his champion stable of horses, he won the UAE Owner's Championship consecutively from 2000-2005. 10. He was the brother of Shaikh Hamdan Bin Mohammad Bin Rashid Al Maktoum, Crown Prince of Dubai. Dubai: Even as the UAE sporting world was mourning the loss of Shaikh Rashid Bin Mohammad Bin Rashid Al Maktoum, tributes have been paid to a multitalented sportsman, sports enthusiast and racehorse owner. While his legendary skills as a horseman helped him win three European Open Endurance Championship gold medals, he was also admired and respected as a talented flat-racing jockey, footballer and swimmer. Shaikh Rashid will always be remembered as a very special competitor and one who contributed enormously to the dominance that the UAE endurance team enjoyed between 1998 and 2005. His finest hour came at the 2001 European Open Championship in Italy where he won the individual gold medal which paved the way for the UAE to clinch the team gold, a feat that would be repeated at Punchestown, Ireland in 2003 and Compiegne, France in 2005. At the Asian level Shaikh Rashid bagged the individual gold medal at the 2006 Doha Asian Games while leading the UAE to victory in the team competition. The UAE was represented by Shaikh Hamdan Bin Mohammad Bin Rashid Al Maktoum, Crown Prince of Dubai, Shaikh Ahmad Bin Mohammad Bin Rashid Al Maktoum, President, UAE National Olympic Committee; and Shaikh Majid Bin Mohammad Bin Rashid Al Maktoum. Meanwhile, Saeed Hareb, General Secretary, Dubai Sports Council (DSC), led the tributes to Shaikh Rashid. “This is such a huge loss to the sporting fraternity in the UAE and to the brotherly Gulf nations,” he told Gulf News. Shaikh Rashid was also the founder and chairman of Dubai Club that is based on the outskirts of Dubai on the Oman-Hatta Road. “He played for the senior team much before the UAE Football Association (UAE FA) adopted professionalism a few years ago,” Hareb reminisced. In horse racing Shaikh Rashid was a prominent owner who swept to five UAE championships between 2000 and 2005. His maroon racing silks were carried to victory in some of the biggest races during the Dubai World Cup Carnival while Rhythm Band, ridden by his retained jockey Ted Durcan, gifted him the prestigious $2 million (Dh7.34 million) Dubai Turf (G1) on Dubai World Cup night in 2000. On the same day, Durcan, a seven-time UAE champion jockey, would ride Shaikh Rashid’s Conflict to win the $1 million Godolphin Mile (G2). Shaikh Rashid also won the Godolphin Mile in 2005 with the Mike de Kock-trained Grand Emporium. His other notable wins came with Little Jim in the UAE 2,000 Guineas (2004) and Terrific Challenge in the Mahab Al Shimaal (G3). Estimraar was one of his favourite horses with wins in the Al Maktoum Challenge Round 1, Al Shindagha Sprint and Mahab Al Shimaal. In 2001 he acquired a horse called State Shinto who made UAE racing history by competing in four consecutive Dubai World Cups. Although he did not win, State Shinto did come close in 2001 when he finished in fourth place behind American-trained Captain Steve. Abdul Rahman Al Owais, Minister of Health, Vice President and Chairman, Executive Council, UAE National Olympic Committee (UAE NOC), described Shaikh Rashid as a true horseman who had brought honour to his country at various international events. Mohammad Al Kamali, General Secretary, UAE NOC, noted that Shaikh Rashid’s achievements will withstand the test of time. “Shaikh Rashid has left behind his achievements and these will stand as a consolation to all of us,” Al Kamali said. Ahmad Al Kamali, IAAF Council Member and President, UAE Athletics Federation, recalled Shaikh Rashid’s pivotal role in the annual Dubai Marathon. “In 2003, Shaikh Rashid approached us and told us he would support the Dubai Marathon, and it was due to his support and backing that we have been able to take this race to being one of the most sought after events on the athletics calendar,” Al Kamali said. Dubai: Shaikh Rashid Bin Mohammad Bin Rashid Al Maktoum was the eldest son of His Highness Shaikh Mohammad Bin Rashid Al Maktoum, Vice-President and Prime Minister of the UAE and Ruler of Dubai. He was born on November 12, 1981. Shaikh Rashid completed his schooling in the UAE, and graduated from Britain's Sandhurst Military Academy in 2001. He was appointed President of the Dubai Cultural and Sports Club in 1997. During this time he visited the International Olympic Committee (IOC) in Lausanne where he met Francois Carrard, IOC Director General, and discussed ways to make the UAE one of the training centres of international sports. He held the post of the president of the UAE National Olympic Committee from 2008 to 2009. Shaikh Rashid was a sports enthusiast and used to play football for Dubai Club. He was also president of the Dubai Club. He took part in many endurance rides and won several races, including the 120km Pyramids International Endurance Championship at the Giza pyramids in Egypt. He won the individual gold in the 2001 edition held in Peruggia, Italy. He shared the top spot in the FEI Emirates Endurance Worldwide Ranking in 2003. Shaikh Rashid won the individual gold in the 120-km endurance ride at the 15th Asian Games held in Doha in 2006. He was also a part of the winning team with his brothers at the same event. Shaikh Rashid owned many race horses and won prestigious races. He also owned Zabeel Stables. With his strong string of horses, he won the UAE Owner's Championship consecutively from 2000-2005. Shaikh Rashid was the lead campaigner of Dubai Cares, when it was launched in 2007. He reiterated: “Educating children can have a very real impact on all our lives” while appealing to the retail sector during the campaign. "Our futures and our own children's futures are linked to what happens in the rest of the world. Through the education that Dubai Cares intends to provide, we may well lay the foundations that will provide a scientist, sometime in the future, whose work will save your or my grandchildren from death and disease," he said. A shirt worn by Shaikh Rashid fetched a mammoth Dh16 million for Dubai Cares at a charity auction.